Needless to say, the subway system displayed on that map is not the one that exists today. Some of the changes I was already aware of: the new Line 9, the completed Incheon Airport line, the new Bundang Line, the Line 3, Line 7, and old Bundang line extensions, 2 new Incheon Lines, a light railway going north from the Line 2 spur at Sinseol-dong, etc. Many of these are described in this video. 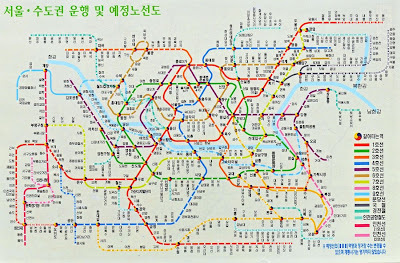 But there are a few there I know nothing about, such as an extension south from Sosa station in Bucheon, and other spur lines. The interesting thing is that there are several planned lines missing from that map, but I'll look at those more closely in another post. I hope everyone reading this has a merry Christmas and happy new year. 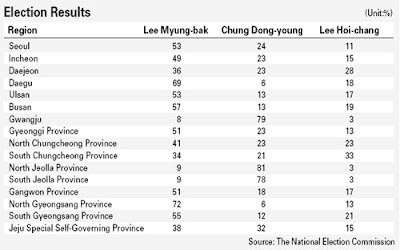 The election statistics above, taken from the Joongang Ilbo, show that Lee Myung-bak managed to get 30% of the vote or more in every province and city except for North and South Jeolla province and Kwangju. While it may have been due to the Honam region's historical antipathy towards right wing candidates, there may have been other reasons. 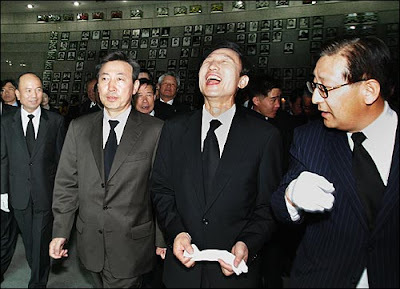 Was it due to this reaction which was caught on camera when he visited the National Kwangju Uprising Cemetery in April of 2005 (which Ohmynews was happy to publish)? 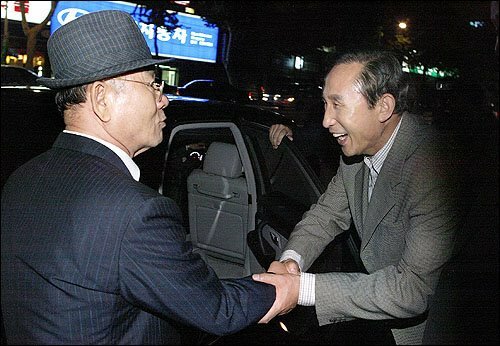 Was it due to him inviting Chun Doo-hwan to the opening of Cheonggyecheon and seeming so happy to see him? 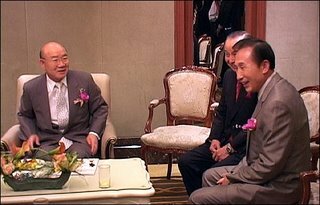 Or was it due to Lee not bothering to come to Kwangju on the 26th anniversary of the beginning of the Kwangju Uprising (like all the other major presidential candidates) and instead getting together with Chun Doo-hwan in the crystal ballroom of the Lotte Hotel two days later? Doing all of these things together is a pretty good way to guarantee that the southwest is going to vote against you. 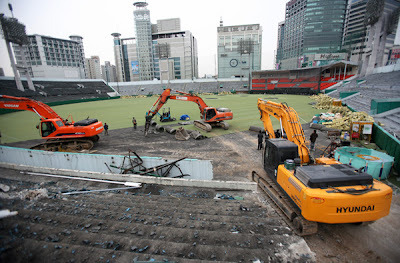 The day before former Hyundai Construction CEO Lee Myung-bak was elected president, the demolition of Dongdaemun Stadium began. To see a clip with more triumphant music, look here. 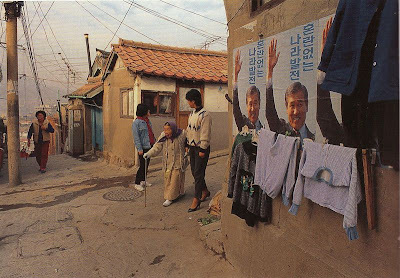 The redevelopment of this area was supposedly announced by Oh Se-hoon after he became mayor of Seoul, but the story goes back further. 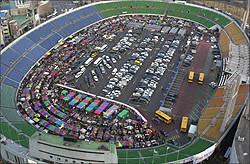 Prior to its destruction, a flea market was to be found in the athletics stadium at Dongdaemun. 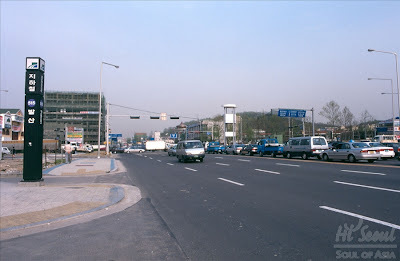 Prior to that, these vendors were located along and under the old Cheonggye expressway. As always, the process of the transformation wasn't as pleasant as the final product, as this video shows. 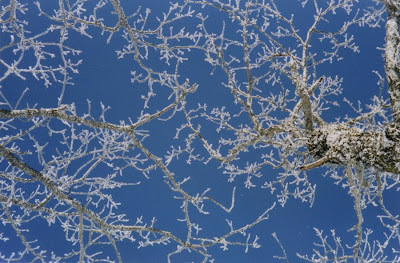 The contents of the video are described in this December 1, 2003 Joongang Ilbo article. Three decades ago, merchants congregated in the Cheonggye area, just east of the city center, to establish what grew to be the largest open-air market in the city, selling all things used, smuggled and shady. But yesterday morning, the Hwanghak-dong Flea Market was no more. 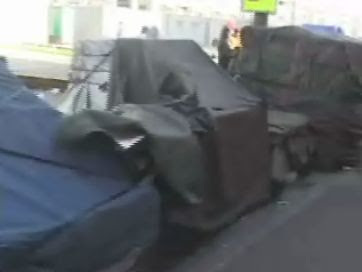 The flea market merchants had piled the street with trash and used tires and set them on fire before dawn yesterday; some of them had been camping out since Saturday night hoping to stop the contractors from moving in. It took, however, a 20-minute clash between a group of merchants who refused to vacate the sidewalk and hired-gun demolition specialists. 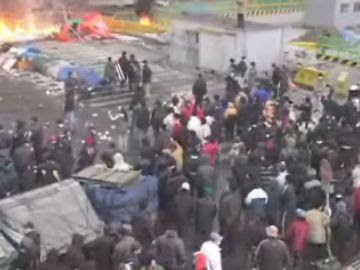 Although violence was anticipated and 4,500 riot policemen were on hand, the battle was an uneven one. The roustabouts hired by the city government numbered about 3,500, facing 250 merchants. The 250 merchants were no match for the 3,500 workers who surrounded them and quickly chased them away while police looked on. 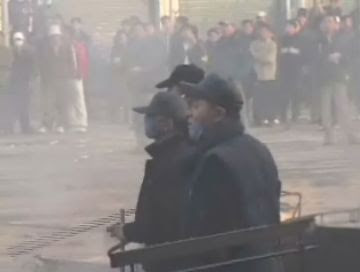 They and their heavy equipment were delayed for only 20 minutes by vendors swinging steel bars and hurling plastic roadblocks. 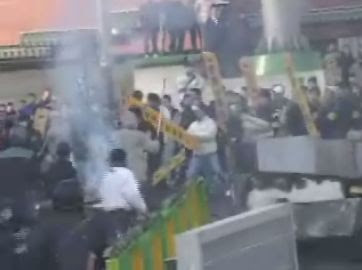 By 11:30 a.m., the fight was over; the police have five people in custody, including an official with the national association of street vendors, Hong Kyung-hee, whom they charged with instigating the violence. 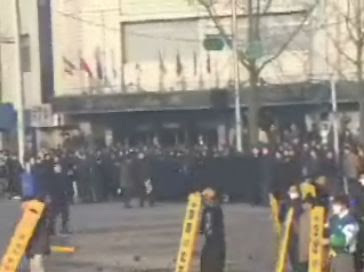 A Seoul city official said about 250 merchants who cooperated with the eviction would be able to continue business in the Dongdaemun Stadium area, just south of the old market. Ah, 'roustabouts'. They're usually known as thugs or gangsters. In the video it seems that the only people holding steel bars are the 'roustabouts', but it is just one video. 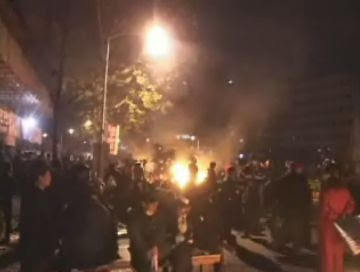 And the police reaction is typical of such situations, where the thugs do the dirty work as the police form a perimeter. At any rate, it was reported again the next day that the vendors would be moved to Dongdaemun, among other places. 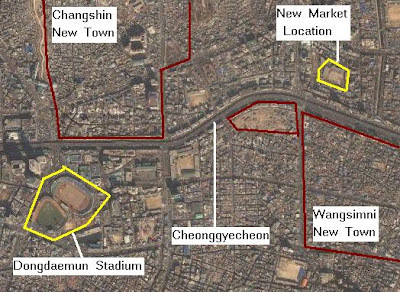 Belongings of 600 merchants out of a total of 1,200 in the Cheonggye area were moved to Seoul’s Dongdaemun Stadium and Nanji Sewage Treatment Plant. The city decided to let 400 merchants who cooperated with the city’s eviction operate their businesses inside the stadium. Civic groups said the city needs a better policy. “Instead of repeated crackdowns, protests and the resumption of illegal business, the city should establish a registration system to actually issue permits and supervise the street vendors’ operations,” said Kim Eun-hee of the Citizens’ Solidarity for a Walkable and Sustainable City. 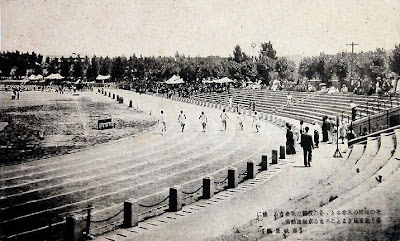 As for Dongdaemun Stadium, it was opened in 1926 and improved at different points after that. Crammed onto the former athletic field are nearly 900 vendors’ stalls, lined in endless rows on the asphalt field. 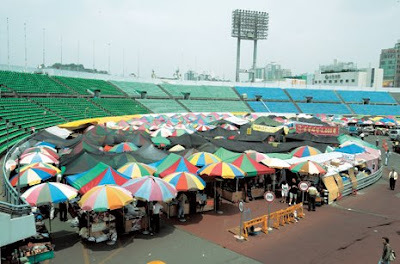 Those who continued trading moved into Dongdaemun Stadium, whose flea market opened Jan. 16. Although traces of the color and old glory endure ― the cornucopia includes fossils of prehistoric animals, brass crafts imported from China, classic vinyl records, antique cameras and old Korean books ― much of the excitement and nostalgia that lured people to Hwanghak-dong in days gone by has vanished. 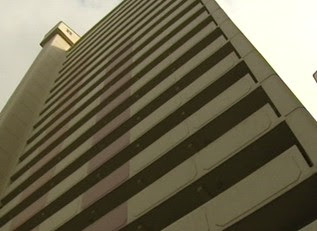 Compounding this, vendors are angry over the city’s perceived failure to keep its promise to provide certain amenities. The flea-market shopkeepers attributed their plunging sales to several factors such as the cramped conditions in the stadium, as well as the lack of electricity and restrooms. Because electricity cannot be fed into individual stands, stalls must close by sunset. The city broke its promise to provide services like electricity, water, more restrooms and tents large enough to keep out sun and rain, shopkeepers say ― promises made before the merchants agreed to relocate. 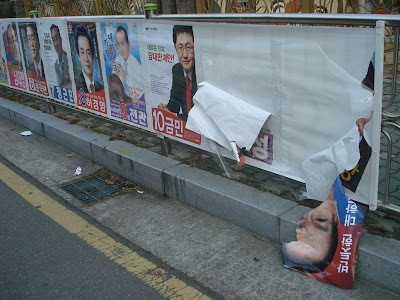 In his efforts to publicize his "successful" reopening of the Cheonggyecheon Seoul Mayor Lee Myung-Bak squandered 1 billion won (about 959,000 US dollars) on a variety of public relations program for the stream, which has incurred complaints and anger among the citizens. Critics argue that all of Mayor Lee's projects including the Cheonggye recovery are actually intended to aid his ambition to become president. Cynics jeer that Mayor Lee is the most capable mayor of all in the history of Seoul when it comes to publicity. Based on sales figures for Sundays, when the market is busiest, the number of visitors declined to 30,000 in the winter of 2004 but recovered to 70,000 last October with the restoration of Cheonggye Stream. However, the number of visitors has fallen again to 30,000 recently. 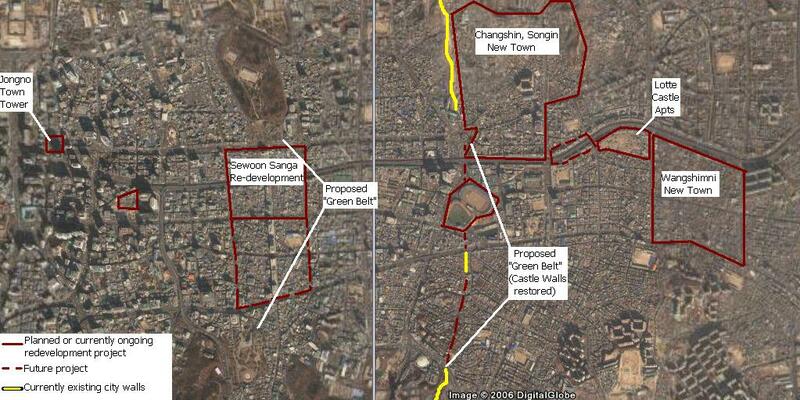 Alas, little help may be forthcoming from Seoul City, which plans to convert the surrounding area into a park. 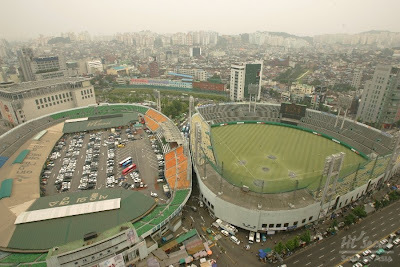 The open air stalls in Dongdaemun Stadium are one of the obstacles to the plan, which includes using a nearby baseball field and restoring the Dongdaemun fortress site. But the vendors remain resolute. “If the city closes the flea market in the stadium, we’ll have nowhere else to go. I will not give up on this site, said Mr. Kim. For these vendors, the demolition moves represent yet another in a long line of broken promises from the Seoul government. This was not their original place of work: they were moved here from the Hwanghak-dong flea market after former Seoul city mayor Lee Myung-bak implemented a restoration project of the Cheonggye stream in 2003. At that time, the vendors believed the former mayor’s pledge to build a world-renowned flea market. 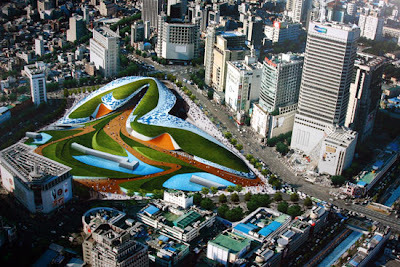 However, the pledge changed shortly after incumbent mayor Oh Se-hoon took office in May last year, as one of Oh’s campaign promises was to build a park and a design center nearby Dongdaemun. 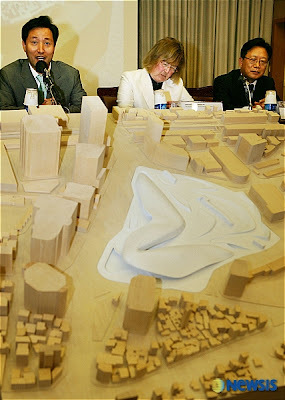 As that January, 2006 article shows, the plan to demolish Dongdaemun stadium dates back further - in fact much further. Here is a screenshot of a presentation made in September 2004. 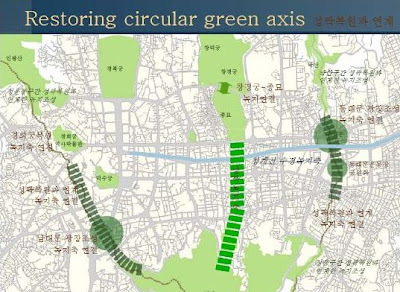 It's pretty clear that Dongdaemun stadium is slated to be replaced by green space; another map shows that they planned to rebuilt the city walls through the new park. A great deal of the future planning for downtown Seoul can be found in the presentation, in pdf form here. The 'axis' plans seen above weren't announced to the public until June, 2006. It's hard to be sure, but I imagine these kinds of plans were around for awhile, just waiting for a green light. Is it possible they had decided less than a year earlier that the stadium they were going to move the vendors into was going to be destroyed? If so it was a cynical but successful way to defer a confrontation with the vendors for a few years. On August 10 the design for the new park was chosen. Many more images of the project can be found here if you scroll down. One thing that must be said is that they certainly didn't opt for a boring choice. It helps to reinforce the concept of Cheonggyecheon as the precursor that many other redevelopments would cluster around. The country’s largest secondhand street market will be relocated from Dongdaemun Stadium to [the grounds of a former middle school in] Sinseol-dong near the Cheonggye Stream, the Seoul city government announced yesterday. Spending 3 billion won ($3.1 million), the city vowed to transform the new marketplace into a tourist attraction for domestic and foreign visitors by March next year. It's a step up from the treatment the vendors received when they were first moved to the stadium. Whether the city will follow through on this promise is a question for another day. What's interesting is the way the history of the past few years is glossed over in the following paragraph of the article. The market, selling secondhand goods and antiques, was originally located in Hwanghak-dong, Jung District, next to the Cheonggye Stream, which was then covered by a road. 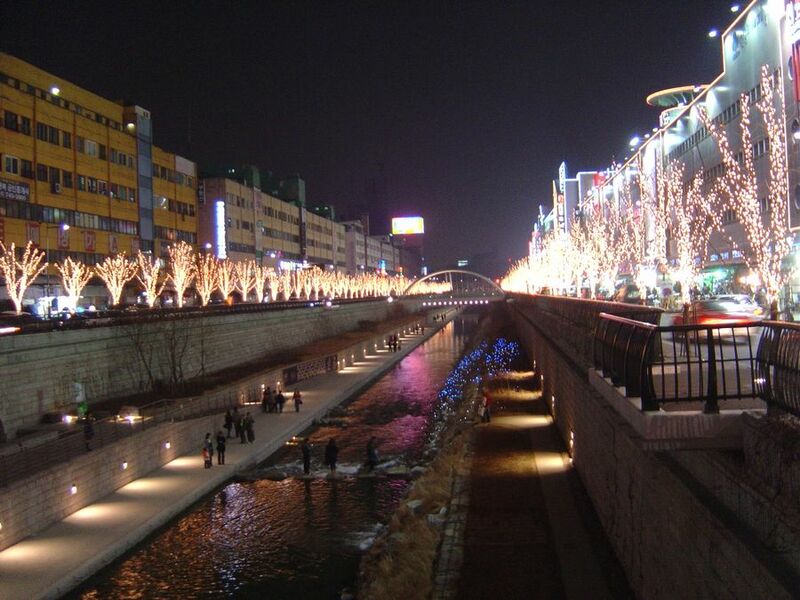 In January 2004, the market’s 900 street vendors were moved into a soccer stadium in Dongdaemun after Lee Myung-bak, then mayor of Seoul, decided to restore the stream. 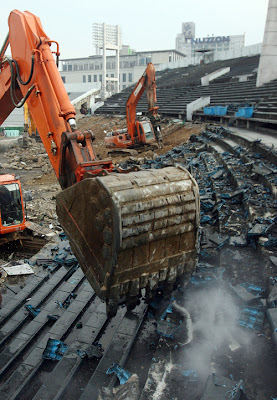 Last year, Seoul Mayor Oh Se-hoon announced the demolition of Dongdaemun Stadium to transform the area into a fashion street with a park, enraging the street vendors who were faced with eviction again. Other than the last sentence, it almost makes it seem painless and inevitable, when you look back at it in this way. As for the present, I imagine the process I described above will play itself out with ever increasing frequency over the next five years. "you’re going to need a neckbrace"
Your society is changing so fast you’re going to need a neckbrace just to watch it go. Talk about summing it up perfectly. The 15km Kangdong section of Seoul Subway Line No. 5 linking Wangsimni in central Seoul to Sangil-dong in the southeast will open today five and a half years after construction began.The new line will make Seoul's subway network 148km long. The section will have 14 stations and passengers will be able to switch to Subway Line 2 or the Korean National Railway at Wangsimni Station. The section has cost 912.9 billion won, according to Seoul city officials. [..] Construction of other parts of the Line No. 5 connecting Panghwa and Sangil-dong will be completed around the end of the year, providing access to Kimpo International Airport. In particular, pager users will suffer no inconvenience underground because the section is equipped with complicated communication devices enabling the operation of beepers. The Seoul Metropolitan Rapid Transit Corporation said digital mobile phone services will be available in underground stations and trains for the partly-opened subway line 5 as well as 7 and 8, due to go into service sometime this fall.[...] Thus far, it has been possible only when the train was moving above ground or in subway stations that weren't so deep underground. [...] It was easy to install the mobile communications systems and antenna cables necessary while the new subway lines and stations were being constructed, explained an official of the rapid transit corporation. A part of Subway Line No. 5 linking Kimpo International Airport opened early this morning, five years and nine months after construction began. The new subway line is linked to existing lines Nos. 1 and 2 at Sindorim station, thus allowing commuters from the airport and beyond to reach downtown Seoul in just 45 to 50 minutes. A[...] foreseeable problem might be the transfer at Sindorim station, which is already conjested during rush hours as lines 1 and 2 converge there. According to the Seoul Metropolitan Subway Corporation, at least 40,000 more people are expected to join in the mass exodus of early morning and late evening commuters at the station every day. I couldn't help but think, "Hold on - Line 5 doesn't pass through Sindorim at all." It took a moment before I realized that the Line 2 spur line (pictured above) from Sindorim to Kkachisan, the existence of which never made sense to me, was originally part of an early phase of Line 5. However, when construction for the remainder of Subway 5 is completed in November, Kimpo International Airport will be linked directly to Kwanghwamun in downtown Seoul. Hence, the inconvenience of transferring at Sindorim will be eliminated, and travel time will be cut in half to about 20 to 25 minutes. What's interesting is that, as it hasn't been used in the 11 years since it was completed, the sign above uses the old romanization (like these Korea Times articles) and reads 'Panghwa' with a 'p'. A maintainance worker I used to teach said he had to come here every night to check on the station, and that two people had killed themselves there (presumably by walking through the tunnel to get there. He said it's a bit spooky at night. In trying to find the Magok Station construction photos above, I found a set of photos taken between January and October 1996 showing the area around Balsan Station and Ujangsan, Magok-dong, Banghwa-dong, Gungsan, and Hwagok-dong (starting here, go left at the bottom). Above is Balsan Station on Gonghangno looking east. If you look below you can see where the photo above was taken (in the center looking towards bottom right). 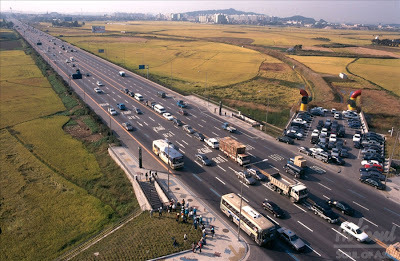 You can also see Magok-dong (the fields) Banghwa-dong at top center and Gimpo Airport at far left. Note also the subway exits opening next to the fields; the path of the subway line can be seen arching across the fields. 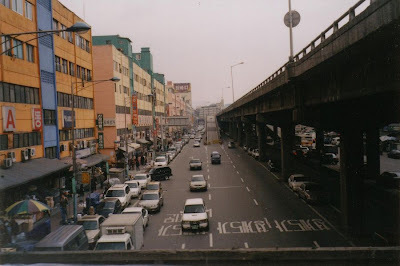 This view is almost the same today; despite being approved for development in 1996, Magok still has yet to be developed, though plans are in the works. 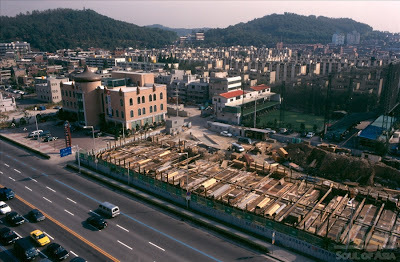 If you continued towards bottom right, you would travel through the next two photos, which show the area around Balsan Station (especially Deungchon-dong) being constructed. Along the top are apartment buildings which would have been built around 1993 or 1994 (and thus were quite new in 1996). 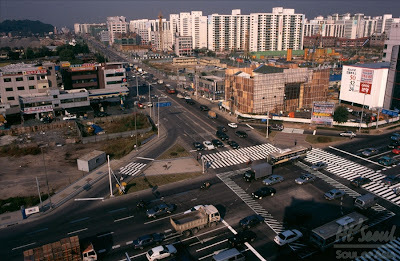 This area, much like the northern part of Banghwa-dong, were built as a 'city development' over farmland in the early 1990s. These developments in such 'rural' areas were closely related to the planned subway route. Continuing along, the street below (Gonghangno, heading east) is today the middle class family restaurant playground of Gangseo-gu, though in 1996 it still had a ways to go. 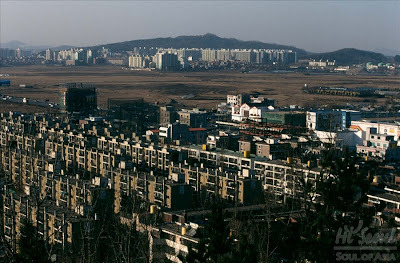 In the photo above, if you were to stand on the building in the center and look to the right, these much older apartments would be seen, along with Hwagok-dong and Ujangsan in the distance. Banghwa-dong looks quite a bit different today, and due to the apartments in the foreground having been replaced with towering apartment blocks two years ago, this view is likely no longer available from the mountain. 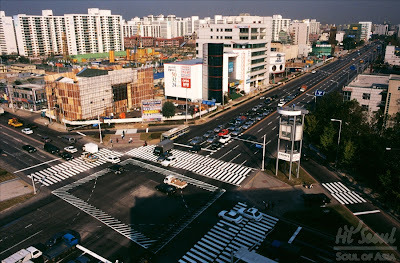 At any rate, on December 31, 1996, Line 5 from Kkachisan to Wangshimni was opened, linking downtown Seoul to Gimpo Airport. The 14.1-kilometer downtown section of Seoul Subway No. 5 opened yesterday, directly linking Kwanghwamun and Kimpo International Airport by spanning the Han River through underwater tunnel.The downtown section opening means the completion of the full 52.21- km No. 5 Line from Panghwa near Kimpo to Sangil-dong via Yoido and Wangsimni. With the opening of the subway's downtown section, work will begin tonight to dismantle Tangsan Railroad Bridge that spans western Han River on the Subway Green Line, a loop that serves thousands of commuters in Seoul every day, following an inspection that found it unsafe. 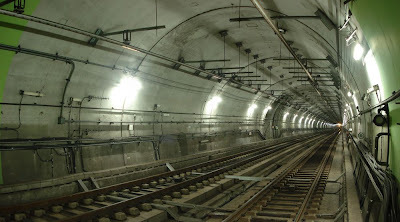 Once the work is underway, the subway line will not operate its entire course, halting its service at Hapjong Station north of the Han River and at Tangsan Station south of it. With the trans-river subway operation out of service, an estimated 300,000 commuters who use the facility every day will be penalized and sent scrambling for alternative means of transportation. They had to scramble for almost two years. The new Dangsan Bridge wasn't opened for use until November 22, 1999. Popseoul reported a week ago that a new trailer from the film 'Hellcats' (or 'I like it hot') showed Wonder Girl member An So-hee and co-star Kim Bum kissing (as well as the other characters in bed with their respective lovers). I do find it amusing that they covered up the kiss with a heart. We mustn't let anyone get the wrong idea about So-hee, right? It seems like a rather confused advertising campaign. Perhaps the appeal of the latter photo is that the male viewer is left to think, "Hey, that could be me being held by a 15 year-old." Unfortunately, that fantasy was ripped to shreds the moment the aforementioned male viewer saw the new trailer - "Hey! That's not me!" Wonder Girls fans responded to the image of So-hee kissing a male other than themselves with rage and their comments on Kim Bum's Cyworld page forced him to close it down. Fans left comments on the film's homepage as well. The victim's comment made it seem as if he wasn't too preturbed: "So-hee's fans are really scary…kekeke. I’m definitely going to get shot by a runaway soldier." The question remains - were these teenaged boys who undertook this form of 'cyber terror', or were they guys in their 20s... or 30s? The victim seemed to be taking it all in stride, suggesting that perhaps it isn't just nasty comments left on a person's homepage that lead to suicide. At any rate, the Wonder Girls virus continues to spread (and a test to check for the virus may be necessary for Korean students wishing to study in the US), as the Donga-Ilbo has taken to calling Kim Yu-na a “Wonder Girl” after her second victory at the Grand Prix finals, which has got to make her feel that all those years of training were worth it. Perhaps it's better than "Figure Pixie (or 'elf') ", the media's old name for her, though she seems to have graduated to "Figure Queen" these days, as she's called in a photo caption here (if you look at the comparison chart near the bottom, tell me, could they choose a worse looking photo of Mao Asada?). On December 7th the students who took the Suneung, or college entrance exam, received their marks. The media duly published photos of happy students who were college bound. I couldn't help but think that they were missing out on the reactions of the majority of the test takers, who didn't do as well as they'd hoped. It seems those kinds of students only get noticed by the media if they kill themselves in the time honored manner of leaping from buildings. * At four AM Monday morning, the Joongang Ilbo reports, twin sisters in Changwon did just that. The twin sisters had been under enormous stress lately, worrying about their scores on last month’s national College Scholastic Ability Test. 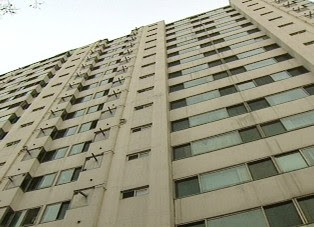 The stress may have been enough to cause the high school seniors from Changwon, South Gyeongsang to plunge to their deaths from a high-rise apartment building. “I wish you happiness with mom and brother. Sorry I wasn’t a good daughter,” one of the victims wrote in a text message to her father’s cell phone just before committing suicide, police said. 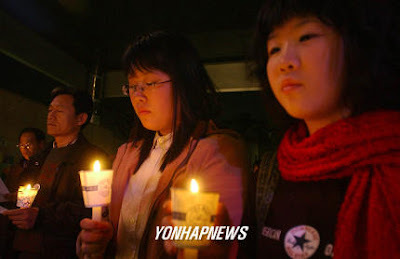 The police confirmed that the victims were twin high school seniors, both 18, who went to school in Changwon. The twins had been in agony since they received their test scores last week, according to an initial investigation by police. The sisters left home after receiving the test results and had been missing for two days, police said. The personal belongings of the two sisters, who were not identified, included a cell phone and a watch that were found near an emergency exit staircase on the 25th floor. A window was open beside the stairs, police reported. It turns out these girls were not the only victims of the suneung this year. 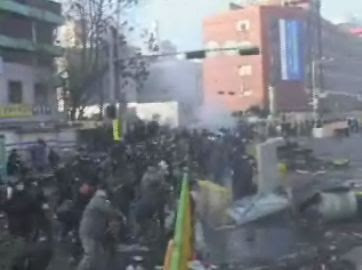 As this article elaborates, in Seoul's Ichon-dong at one in the morning on November 17, essentially the day after the test, the 21 year-old student jumped from this building. Apparently there are complaints about the vagueness of the new suneung grading system. I don't think it's only students who feel that way. 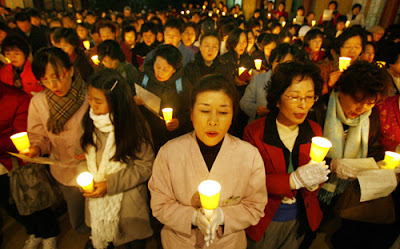 There have been other candlelight gatherings regarding the suneung as well, though the one pictured below was a protest against the suneung after a girl in Namwon killed herself on November 5, 2003 (the picture of the open window above was where she jumped from). I wrote about a student killing himself on the morning of the test two years ago; more died before that, and more will continue to die in pattern so predictable that you can set your watch by it. * Which leads to the media declaring such apartment buildings to be degenerate threats to the welbing of children and the construction ministry announcing new regulations for the reconstruction of such buildings requiring a death record check which needs to be notarized in the hometowns of every resident in the complex before a reconstruction permit can be issued. 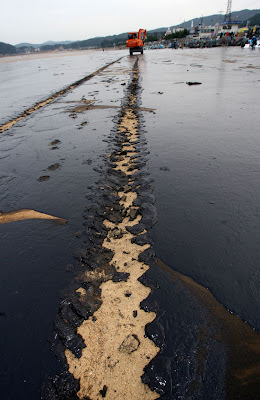 The photo below gives a pretty clear idea of just what kind of ooze is coating the beaches of Chungcheongnam-do. The photo is from here (where more can be seen - note the difference between the contaminated and normal oysters). 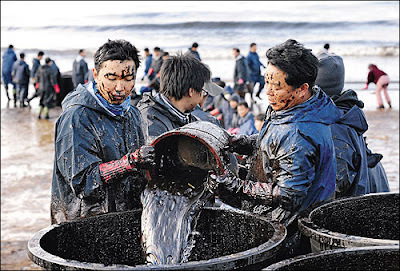 More on the disastrous oil spill can be found in the Donga Ilbo, Chosun Ilbo, Hankyoreh, Korea Times, and Joongang Ilbo. I couldn't help but think of the Simpsons episode where Lisa goes to clean up a polluted beach after an oil spill but so many Hollywood stars had claimed spots on the beach that there was no room for her to help. Lee Hyori may have gotten all muddy in Africa, but now may be Kim Tae-hee's moment to get down and dirty after breaking a sweat serving food to the less fortunate in soon-to-be-razed Garibong-dong. On a related note, I'm not sure if this was the best way for Samsung to draw attention away from its slush-fund-for-bribery scandal. The four went on the rampage in the subway station in May and beat Cho who tried to stop them, causing him injuries requiring three weeks of treatment, the prosecution claimed. On May 19, 1995, a group of American soldiers got into a fight with a group of Koreans on a subway in downtown Seoul (either line 3 or 4), which led to an outpouring of anti-Americanism in Korea which focussed on calls to revise the Status Of Forces Agreement regarding how U.S. soldiers are treated in the court system in Korea. I first read about this incident here. It all began when an American soldier put his hand on a Korean woman's rump. The version that has captured the local imagination is that a group of drunken American soldiers were rampaging through the subway, molesting Korean women, and that the soldiers then attacked good citizens who dared protest the errant hand. The American understanding of events starts with a fact that the Koreans tend to leave out: The American soldier and the Korean woman whose behind he patted were in fact a married couple. The Americans say the problems arose when some angry young Koreans on the subway accused the American of sexually harassing the Korean woman. When the Korean woman explained that she was the American's wife, the Korean men allegedly spat at her and slapped her -- leading the woman's husband to punch the man who slapped her. In any case, the result that evening in May was a huge brawl in the subway. It has reverberated through the country and underscored the delicacy of the mission of the 37,000 American military personnel in bases in South Korea. [American Ambassador James T.] Laney says the problem is not that American soldiers are committing more crimes, but that an irresponsible Korean press is portraying them in a particularly lurid way to an inflamed public. While cases like the subway incident are seen by Koreans as evidence of the need for protection from rampaging Americans, to Americans they show that they need protection from a skewed local judicial system. After the subway brawl, no Koreans were indicted, but four Americans were. Two United States Forces Korea servicemen indicted on suspicion of assaulting a Korean man in a Seoul subway station during a brawl in May, yesterday flatly denied they beat him during the first session of a trial for the "subway incident" which stirred up anti-American sentiment among Korean people. Serg. and the other defendant said that they did not beat Koreans and rather they were beaten by Koreans while trying to stop them assaulting [the sgt. ]'s Korean wife, , at the Chungmuro Station on May 19. The trial is being held at the Seoul District Court, and is presided over by Judge Kim Tong-hwan. The American soldiers were prosecuted without physical detention on charges of violating the Law on the Punishment of Violent Acts. They allegedly ganged up to beat Cho Chong-guk, 28, who was trying to stop them from creating a disturbance at the subway station late at night. Cho suffered an injury requiring three weeks of medical treatment. He later staged a two-day hunger strike in front of the U.S. compound in Yongsan, demanding the punishment of the U.S. servicemen involved. Meanwhile, the court fined [another] Corporal and [the sgt. 's wife] 1 million won and 500,000 won for their involvement in the violence, the penalty sought by prosecutors, in a summary judgement. Poor 28 year-old Cho Chong-guk, who was left so incapacitated that three weeks of medical treatment were necessary ('You mean my health insurance covers this?!'). It's nice to see that the true victim - a woman who was spit and slapped on - was given a 500,000 won fine, while the men who spit on and slapped her weren't even indicted. Considering how, in this case, it was said that Korean witnesses' testimony are given more weight than foreigners, why would the Korean victim be punished? I guess when you match a Korean woman's testimony (especially one who was married to a - gasp - foreigner) against a Korean man's testimony, the woman was more likely to lose. Of course that was back in 1995, and I'm sure such discrimination (against Korean women or foreigners) does not occur today. One of the four off-duty U.S. servicemen and a dependent involved in the alleged beating of a Korean in a subway station in Seoul in May was found guilty as charged and given a six-month jail term yesterday. Judge Kim Tong-hwan of the Seoul District Court sentenced Sgt. , 31, to six months in jail for violating the Law on Punishment of Violent Acts. Prosecutors had demanded one year behind bars. [The Sgt.] is entitled to an automatic appeal and he will not have to start to serve the sentence until the legal process reaches its end in accordance with the Korea-U.S. Status of Forces Agreement (SOFA). Cpls. and , and [the Sgt. ]'s wife, three others involved in the case, were slapped with fines of 500,000 won, 1 million won and 500,000 won respectively as the prosecution demanded. In the ruling, Judge Kim said, "A jail term was given to the accused  because it was proven beyond reasonable doubt that he beat Cho Chong-guk, 28 in Chungmuro Subway Station in Seoul as charged." "[The accused] has shown no signs of remorse but rather argued that he was the victim in this incident, which made it impossible to settle the case with Cho out of court," he said. The four went on the rampage in the subway station in May and beat Cho who tried to stop them, causing him injuries requiring three weeks of treatment, the prosecution claimed. They were indicted without physical detention on May 19. It's good to see that the prosecution put so much work into figuring out who was truly responsible. Two United States servicemen involved in a brawl in the Seoul subway last May were given fines yesterday, instead of prison terms, in an appeal to the Seoul District Court. [Sgt. ], 32, who had been given a six-month prison term by a lower court, was fined 1.5 million won (some 1,900 dollars), and , 24, was fined 500,000 won (some 610 dollars) for their violent acts in the subway. The subway brawl a year ago fueled strong anti-U.S. feelings here and led to a campaign to revise the Status of Forces Agreement Korea has with United States Forces Korea. Giving the lighter punishment, the bench said, "The court clearly finds the defendants guilty of violent acts, but has decided not to hand down prison terms because of concern over the negative effects these would have on their service careers." How thoughtful of the Seoul District Court.